We’d love your help. Let us know what’s wrong with this preview of Uncut by Christopher Fowler. To ask other readers questions about Uncut, please sign up. I'd encountered Christopher Fowler's short stories in various anthologies over the years - I think Stephen Jones is a fan - as well as reading two of his novels, SPANKY and SOHO BLACK. UNCUT beckoned to me as a master collection of Fowler's short fiction, dating back to the 1990s. What a treat I was in for. The colletion is a mixture of social realism, an obsession with serial killers, gore and black comedy, and some new twists on old horror tropes. London is often the backdrop to the tales coll I'd encountered Christopher Fowler's short stories in various anthologies over the years - I think Stephen Jones is a fan - as well as reading two of his novels, SPANKY and SOHO BLACK. UNCUT beckoned to me as a master collection of Fowler's short fiction, dating back to the 1990s. What a treat I was in for. The colletion is a mixture of social realism, an obsession with serial killers, gore and black comedy, and some new twists on old horror tropes. London is often the backdrop to the tales collected here and Fowler brings it to life in a loving and macabre way that few authors can achieve. The first three stories are an eclectic bunch. THE HUMAN ELEMENT is a depiction of a cruel and heartless city, as experienced by an inexperienced tourist. NORMAN WISDOM AND THE ANGEL OF DEATH is a masterful look at a serial killer who meets his match. ON EDGE is pure ghastliness, with a visit to the dentist that even the bravest would dread. THE MASTER BUILDER, a woman-in-peril thriller, is another masterwork and it's no surprise that a film version was made as it has a real cinematic quality to it. THE TRAFALGAR LOCKDOWN offers some deep-space murkiness, and is brief and straightforward. PERFECT CASTING utilises Fowler's experience of the film industry for a well-described character study. IN PERSIA is a brief twist-in-the-tale, while BLACK DAY AT BAD ROCK is a fine reminiscence of school days in the 1970s. CHANG-SIU AND THE BLADE OF GRASS is a ghostly story set in ancient China, while THIRTEEN PLACES OF INTEREST IN KENTISH TOWN is a brilliantly-conceived travel guide that tells a murder story through subtlety and off-handedness. LAST CALL FOR PASSENGER PAUL strives to capture the horror of a missed connection, while THE UNRELIABLE HISTORY OF PLASTER CITY is a filmic humans-vs-demons action tale. JOUISSANCE DE LA MORT is a one-joke story that somehow works thanks to the author's ghoulish glee at strange death. NIGHT AFTER NIGHT OF THE LIVING DEAD takes the overworked subject of flesh-eating zombies and offers a very British spin on them, while JUMBO PORTIONS will have you avoiding fast food outlets in future. THE LAUNDRY IMP is a traditional horror story told well in a mundane locale, while THE MOST BORING WOMAN IN THE WORLD is perhaps the most believable - and horrifying - story of them all. A great collection of horror short stories. 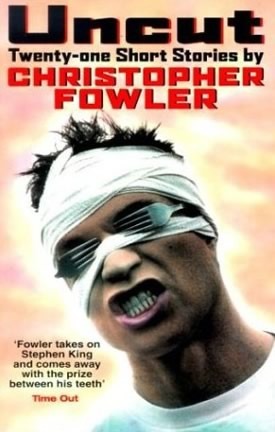 This was the first book that I read by Christopher Fowler. I read it over two hot weeks staying at the Philbeach Hotel in Earls Court and it had a great impact on me. I was addicted and towards the end of the two weeks went to the nearest Waterstones and purchased his entire back catalogue that was still in print and have been addicted to his world ever since. Basically it is a collection of short stories, some horrific, some very funny but all very moving and profound. Read 2 of the stories. Meh. I was fooled by the Time Out blurb on the cover. Stephen King must be crying all the way to the bank.